Secluded, horseshoe-shaped cove on the rugged Ceredigion coast in Wales. Mwnt (pronounced Munt) has the protective eye of the National Trust watching over it and a Green Award – the Blue Flag of rural beaches – to its credit. Stretch your calf muscles on a walk up to Mwnt’s 15th century cliff-top church or don your binoculars for a spot of porpoise-watching. 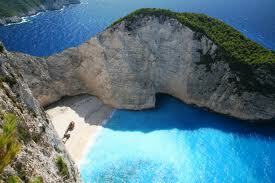 The Ionian island of Zakynthos (or Zante) has its fair share of remote beaches. Set off on a mini-adventure to the most secluded of them all, Smuggler’s Cove. There are boats and private charters circling south to the cove – allowing plenty of time for turtle-spotting on the way. On the southwestern tip of the Algarve, in the heart of the Costa Vicentina, self-styled swimming beach Praia da Ingrina is also one of Portugal’s most beautiful nature reserves. Sea eagles and falcons soar overhead and sheep graze in the surrounding grasslands. The environmental value of the area has also meant hotels are kept at a minimum which in turn has kept the beach deserted. Grab a pew at the beachside restaurant and watch local fishermen coming back from the morning catch. 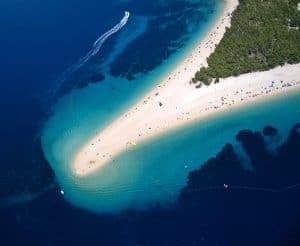 Croatia’s necklace of Adriatic islands boasts a string of fantastic beaches. On the island of Brac, an hour from mainland Split, lies Zlatni rât (the Golden Cape). Day-trippers happening upon nearby Bol, Brac’s oldest town, are left wide-eyed at the dazzling triangle of beach that lies beyond the shops and restaurants. Watch out for naturists swaying in the wind. The mountain range behind Bol makes for fantastic sunset viewing. When you arrive, explore the 25-year-old shipwreck that sits in the middle of the beach and climb the precarious cliff-top platform above it for a spectacular view of the surrounding Mediterranean. On the celeb-magnet Emerald coast in Northern Sardinia, beaches like Poltu di Li Cogghj are suprisingly cheap to reach thanks to the arrival of Ryanair in Alghero. Costa Smeralda has been an eco-friendly luxury paradise since Prince Karim Aga Khan IV famously arrived in the sixties. Poltu is characterised by a row of pinkish rocks that splits the alabaster sands. Watch out for Italian paparazzi lurking in the rugged Mediterranean scrub. 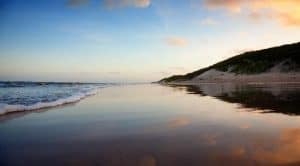 Miles and miles of untouched white sand dunes lie on the tip of Denmark’s North Jutland region. Stand at the ‘Greenen’, the point where the two Baltic waters – the Skagerak and the Kategatt – meet and watch the waves lap in opposite directions. The town of Skagen is also worth a look for the art museum. The entire area is a former artists’ retreat – painters flocked to Jutland for its brilliant light. Who needs the Caribbean when you have the Baelearics? Formentera is the smallest and least developed of the islands – quite a different prospect from its high-living neighbour Ibiza. Es Migjorn is blessed with miles of fine, white sand ensuring beach-goers can find their own spot in the sun. Take advantage of the breeze and try your hand at wind-surfing. A surprisingly pretty beach considering the wind-lashing it gets, Calgary Bay lies west of the town of Tobermory on Mull’s north coast. Heather tops the surrounding hills and a 13th century abbey now houses local wildlife including puffins and golden eagles. Overlooking the Maltese islands of Comino and Gozo – Paradise Bay, on the northern tip of Malta overlooks Cirkewwa and requires some effort to reach but is undoubtedly worth the trek. At the bottom of a flight of stone steps, be wowed by a beach surrounded by dramatic cliffs and ultramarine waters. Hire a deckchair and soak up the beautiful view before bracing yourself for the walk back up. Linked to the French mainland via a bridge the island of Noirmoutier has some of the Western Loire’s most unspoilt beaches. All of Noirmoutier’s 40km fine sandy beaches are crowd-free and clean, making it a great place for unleashing kids. Head to the west coast for the wide, dune-filled beaches or north for rockier coves. Have you been to any of the above? Do you know a better beach hideaway? Please share your comments below or on our Facebook page.